SPOILER ALERT-Do not read if you have not seen episode two of American Gods. The episode opens with Mr. Ibis, who chronicled the Viking invasion in the first episode, making another history entry into a book. This time it is about a slave ship going to the Americas in 1697. One of the slaves prays to his God, Anansi, for deliverance. Anansi appears in the form of Mr. Nancy. Mr. Nancy, is reminiscent of Sportin’ Life from Porgy and Bess. He is dressed in flamboyant, modern attire and speaks of black people in America hundreds of years in the future. Of course, the poor slaves have no frame of reference to understand what he is saying. But one of the slaves, who understands the underlying meaning of Mr. Nancy’s speech, gets angry. He senses the future injustice and completely agrees with Mr. Nancy who is trying to incite them to set fire to the ship and kill the entire crew. Another slave points out the obvious: that they will die if the ship burns. Mr. Nancy tells him he is already dead, but his death could have meaning. Mr. Nancy, in a horribly revealing moment, becomes a giant, talking spider before he breaks the chains of one of the slaves. The freed slave then breaks the chains of the other slaves and sets fire to the ship. As the debris of the ship washes ashore, the spider (Anansi) from the ship walks onto the new land. In the present day, Shadow is getting his side stapled after the beating he took from Technical Boy’s goons. He pounds on Wednesday’s door until it is opened. Wednesday is entertaining a young woman. Shadow tells Wednesday about the beating he took on his behalf and wants answers. Wednesday tells Shadow that answers are not part of the contract, however, he offers to double Shadow’s salary. Wednesday says that he has a plan to deal with Technical Boy for what he did to Shadow, as an attack on Shadow is an attack on him. Shadow has a dream of Laura that night who tells him that her death is just Shadow dreaming a bad dream. The next morning, Shadow goes to their home. As he enters the house, he sees the decorations for a welcome party in the living room and dining room. As he walks around the house, he is haunted by memories of Laura standing by the sink and lying in bed. He starts to pack all of their belongings in boxes. He finds Laura’s phone in the coroner’s box. When he opens her phone, he sees messages from his friend, Robbie, to Laura which also includes a salacious picture of his anatomy which seems to confirm the affair between Robbie and Laura. With his former life packed away in a moving van, Shadow goes on the road with Wednesday. Wednesday tells Shadow that the plan is to meet with several important people around the country. But first, they are headed to Chicago to get Wednesday’s hammer. They stop at a small diner and Wednesday sends Shadow shopping for gifts to bring to the “friends” they will be visiting. At the big box market, Shadow starts picking up the odd items on the list such as actual maps, romance novels, and vodka. As he passes the large flat screen television sets, Lucy Ricardo is on the television, and she starts talking to him. Shadow tries unplugging the flat screen television sets to no avail. They all turn off. However, one turns back on with Lucy, which continues to talk to him. She is the god called ‘Media’( Gillian Anderson). As she changes from black and white to full HD color, she says that the sacrifice of time that people make to her via their large and little screens is better than lamb’s blood. She explains that what Technical Boy and his goons did to Shadow was wrong. She wants to recruit him for her side. She tells Shadow that she is tomorrow and Wednesday is not even yesterday. She explains to Shadow that she is trying to help him. She does not want him to end up like so many released convicts, who commit suicide with a belt around their neck. Shadow races back to confront Wednesday again thinking he is losing his mind. He tells Wednesday about Lucy talking to him. Wednesday speaks in metaphors about what is happening to Shadow, which naturally, frustrates him more. Wednesday tells Shadow that he can choose to believe that either the world is crazy or he is. Either choice is valid. For the moment, it appears that Shadow chooses to believe he is not crazy. Back on the road again, Wednesday is reviewing the purchases made by Shadow. He throws out the phone Shadow bought for him as well as Shadow’s phone. Wednesday says that there is no need for a phone, as who needs to talk to him? Wednesday magically starts the AM radio, which is playing a song about a hammer bleeding, before he falls asleep. Bilquis appears in a montage of sexual partners that she consumes. The final scene is of her viewing an exhibit of ancient Africa. There is jewelry there which appears to have been hers in some prior time. For the moment, we have no idea what part Bilquis will eventually play in the drama involving Wednesday and Shadow. Wednesday and Shadow arrive at the home of Zorya Vechernyaya (Cloris Leachman). She knows Wednesday and she is not happy to see him. However, Wednesday has gifts – vodka for Zorya Vechernyaya, romance novels for one of her sisters, Zorya Utrennyaya, and binoculars for her other sister, Zorya Polunochnaya. 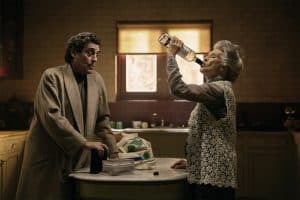 Zorya Vechernyaya takes a good healthy swig directly from the bottle of vodka (literally downs the whole bottle on one go) before she tells her sister to make them coffee. She says that she will tell Shadow his fortune. Shadow tells her that he does not believe in fortune telling. Czernobog returns home. It is obvious that he does not care for Wednesday and demands that he leave. However, it is revealing to note that he calls Wednesday by his real name, Wotan. With no fanfare, the identity of Wednesday is revealed to be that of Odin, the ruler of the Norse gods. Wednesday has brought a carton of cigarettes for Czernobog, who is a chain smoker. Czernobog throws a lamp at Wednesday, who then adds a large hunk of Havarti cheese as well as the carton of cigarettes to placate Czernobog. Zorya tells Czernobog that she has already invited Wednesday to dinner which settles the question. As the sisters prepare dinner, Shadow finishes his coffee. He gives his cup to Zorya Utrennyaya. She shows the coffee grounds to her sister and they are both troubled by what they see. They lie to Shadow and tell him that he will have a long life. Zorya Vechernyaya tells Shadow that his mother died of cancer but he will not. Over dinner, Czernobog tells Shadow that he was considered black because the prejudice was determined by hair color in his country. He was the bad son and his brother with the fair hair was considered the good one. Czernobog tells of how he was a cow killer in the slaughterhouses. He describes in graphic detail the process of killing the cows. He laments the fact that automation has taken over the slaughter of cattle business. Finally, he asks Shadow if he knows how to play checkers. Shadow agrees to play. Czernobog realizes that Shadow is confident is his ability to beat him. 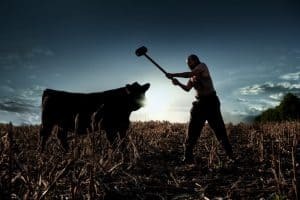 He shows Shadow his hammer that he used to kill the cows. As he describes how he used the hammer to kill, Shadow sees the hammer start to bleed. After this show, Shadow loses his confidence. Czernobog then gives the stakes of the game. If Shadow wins, Czernobog goes with Wednesday, if Shadow loses, he must bend down on his knees before Czernobog and allow him to use his hammer to bash in his head. Czernobog sings a Slavic song, which gives Shadow visions of Czernobog killing cattle. Unfortunately for Shadow, he loses. As episode closes, Czernobog tells Shadow that he will be killed at dawn. While The Secret of Spoons is a very dark episode, it has moments of laugh out loud humor. Media’s leer as she offers to show Shadow Lucy’s bare breasts was laugh out loud funny. Zorya Vechernyaya drinking the vodka straight out of the bottle was a hoot. Wednesday’s shameless flattery of her was almost embarrassing, except that it appeared to be working! Zorya Utrennyaya’s look when she compared the cover of her romance novel to Shadow Moon was priceless. In this episode, we are introduced to several different gods. There is a playback quality to the series and this episode should be watched more than once to catch all of the subtle, nuanced dialogue. Both Orlando Jones and Gillian Anderson are brilliant as Mr. Nancy and Media. Both of these gods’ speeches are incredible descriptions of our current society, while at the same time giving us an interesting history lesson. Mr. Nancy’s speech is reminiscent of the speeches given during the civil rights era of the 1960s. Media’s comments, although brief, on the state of the media and its influence, are chilling in their insight. With the introduction of the Slavic gods, Czernobog, Zorya Vechernyaya, and Zorya Utrennyaya, the pantheon of gods in direct interaction with Wednesday and Shadow goes beyond the Norse gods. Czernobog’s comment about how he is black in the country of his origin is an amazing insight as to how society will always find some way to discriminate against some group. But the most important revelation of this episode is that the true name of Wednesday is Wotan, ruler of the Norse gods. 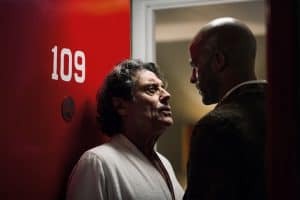 American Gods gets better with each episode. The dialogue is rich and very dense. The classical and contemporary allusions come fast and furious. Click here to join the American Gods conversation on the FoCC forum.